TW-Acustic, a small German company, has made quite an impression on the analog world since it introduced the Raven AC turntable at Munich High End 2005. In quick succession, TW-A introduced five attractive turntables, each with features that made it distinct from its predecessor, yet with an overall design philosophy that demonstrated unifying principles regarding analog sound and the production of precisely wrought mechanics to execute those principles. The eye-popping Raven AC cocked heads with its gorgeous copper platter mat, innovative plinth and platter materials, cantilevered armboards, the number of tonearms it could accommodate (as many as four, à la Micro Seiki), outboard Pabst motors, fine-spun yet lavish sound, and easy operation. Then, in 2007, came the Raven One, a simpler (one motor, one arm) and more affordable version of the AC, but with the same sonic character and precision machining. 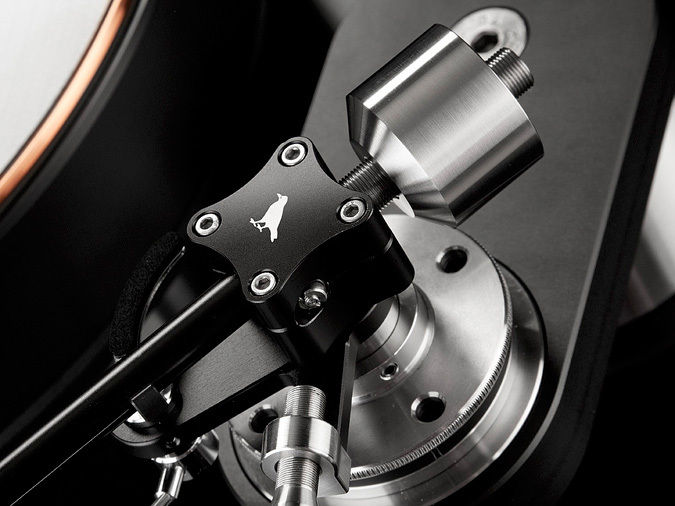 Introduced with the One, the Raven Two featured the ability to mount two tonearms simultaneously. The Raven .5, introduced in 2008 and discontinued shortly thereafter, was the entry-level baby of the family. The Black Night, TW-A’s Gothic flagship, debuted at Munich High End 2009 and is a veritable Batmobile, with a huge and hugely ingenious motor mechanism, a solid-copper platter, astonishingly attractive lines, and a feeling of a sensuous organicism wedded to finely machined industrial design. Finally, the single-chassis Raven Limited, with inboard motor and controller, debuted in 2011. Though only 50 of these handsome units will be made, each comes standard with the subject of this review: TW-Acustic’s new Raven 10.5 tonearm ($5500 USD). 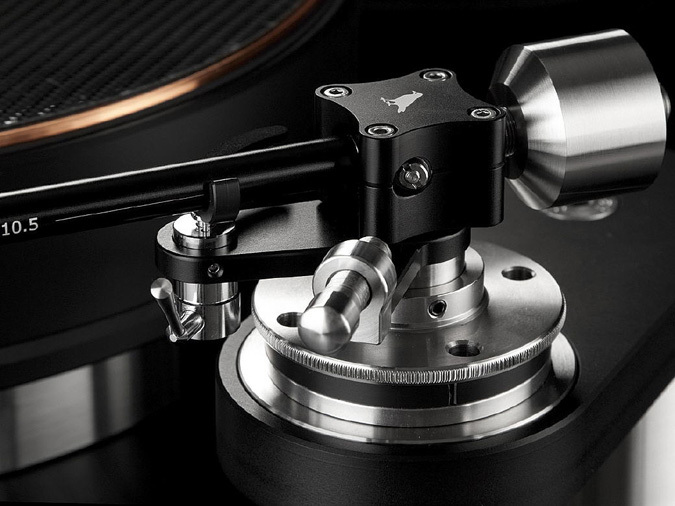 Ever since the first TW-Acustic turntable was launched, the problem has always been which tonearm to use with it. When I bought my Raven Two about three years ago, I agonized over the choice of arm: I visited shows, pestered fellow reviewers, and even asked TW-A’s founder, Thomas Woschnik, for advice. "You can get lucky with a Tri-Planar," I recall him saying, somewhat drily, over the phone from Germany. "Or, you can maybe get lucky with the new Graham, perhaps. The Dynavector is also an extremely good arm -- so pre-szise, hmmh?" I eventually chose the Tri-Planar Mk.VII Ultimate II as my stereo arm, mainly for its rich, sumptuous sound and solid reputation, and have been very happy with it. (For mono and SPU cartridges I have an Ortofon RS-309D.) But I had an inkling that, all the while, Woschnik had been quietly at work on a tonearm of his own. The Raven 10.5 tonearm was introduced at Munich High End in May 2009, and I first heard it at the 2010 Rocky Mountain Audio Fest, with TW-A’s Black Night ’table. 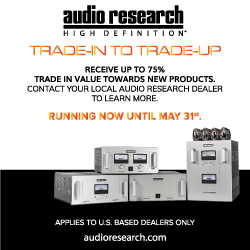 The American distributor, analog impresario Jeffrey Catalano of High Water Sound, had put together a superb system in a corner suite with a TW-Acustic Raven preamplifier, Thoress amplifiers, and Aspara loudspeakers. I came back three times, and noted the outstanding demo in my show report. The look of the Raven 10.5 is stark and striking -- a design, to my eye, entirely counter to superfluity, and based, at least from outward appearance, on principles of economy in materials and movement. Paradoxically, the Raven 10.5 also has an overall sense of precision and luxury, as though not only its operation but the gestalt of each element has been duly considered and incorporated into its design. It’s superficially reminiscent of the Breuer tonearm: as with the Swiss-made arm, there’s a definite stealth quality to the Raven’s feel and look. In a recent phone interview, Thomas Woschnik told me that he and a codesigner began work on the Raven 10.5 in 2007. Both engineers, they established three firm construction principles: 1) simplicity and a preferred length of 10.5"; 2) a precision gimbaled bearing with the lowest possible friction; and 3) an effective mass of 14gm. Woschnik felt strongly that, in order for his arm to be compliant with the most "important" moving-coil cartridges, its mass needed to be between 12 and 16gm. For overhang, and for the best compromise of working with the Baerwald and other alignment systems, he determined that the arm’s length should be 10.5". Finally, for best tracking, Woschnik decided that a gimbaled arm with captured ball bearings, screened for precision, offered the best possible control of the cartridge. From basic idea to first prototype took three years. And Woschnik ended up building more than 50 prototypes of the Raven 10.5. "First, you start with drawings," Woschnik explained. Then he chose his materials. "Aluminum -- the softest you can machine -- was my choice," he said. "Black anodized because black is my color." The armwand, bearing housing, headshell, and lift holder are all made of aluminum; the post, shaft, and headshell handle are stainless steel. The bolt where the counterweights screw on is also stainless steel, as is the wheel for adjusting vertical tracking angle (VTA). Why? "Because this steel is very special -- it comes from submarines," Woschnik said. And it is 100% nonmagnetic. "I don’t want to get into trouble from antiskate magnetics," he said. The antiskating is indeed magnetic: a threaded bolt of stainless steel, handsomely flared, beveled, and mirror-polished at the adjustment end, that screws into a short, cantilevered mounting strut extending from the base of the arm. A negatively charged disc is embedded in the end of this screw; its opposite sits inside the rear of the arm’s housing. Ingeniously, then, the cartridge stylus is always positioned between both fields, and the antiskate is constantly in a dynamic relationship with the tracking movement of the arm. The basic design of the inverted, fixed-gimbal bearing is over 100 years old, "But you choose the materials and machine for lowest tolerances," Woschnik said. For the bearing itself he uses a special bronze mixed with lead (to better accept lubrication), and the pin is high-carbon steel polished with a diamond grease. Both are machined and matched in TW-A’s own shop. Though Woschnik buys commercially made ball bearings, he tests each one for tolerances and variation, selecting only the most closely matched. The result, he says, is a tonearm with virtually no chatter, and that minimizes the "stick and slip" effect that can produce vibrations as the arm makes its sweep across the LP. The "zero-float" VTA adjuster, a feature brought over from the design of the Raven Black Night turntable, might be TW-A’s crowning achievement. Most VTA adjusters work via a simple movable screw on a collar ring: You loosen this screw, then shove the arm post up and down by hand, thus automatically changing the vertical tracking force (VTF), which necessitates constant adjustments and nearly obviates the repeatability of fine tuning. The Raven 10.5’s VTA is adjusted via a smoothly operating collar assembly that sits around the arm post and under the bearing housing. Inside it is a set of plastic discs, made to within 0.001mm tolerances, that gently lift and lower the arm, depending on a control wheel that adjusts its 10mm of motion. Somewhat like the all-brass, aftermarket Pete Riggle VTAF known among analog cognoscenti, TW-A’s stainless-steel control wheel operates smoothly and precisely on the fly as the stylus rides the groove, enabling VTA tuning by ear and dispensing with the simple but tiresome "unscrew and shove" method. In addition to design and choice of manufacturing materials, other things Woschnik was especially careful about were cabling and the position of the headshell relative to the bearing. For inside the armtube he chose a multi-ply copper cable sheathed in silk. The headshell, although adjustable, is parallel with the vertical bearing -- something Woschnik believes essential to avoid problems with azimuth. Finally, the generously long cartridge clips are made by Cardas, and the captured tonearm cables are of stranded 99.9999%-pure OFC copper, sheathed in silk, shielded in more stranded copper, and jacketed in a woven polypropylene. The cables are terminated with nifty spring-loaded, retractable-element Neutrik ProFi RCA plugs "for strong contact," said Woschnik. 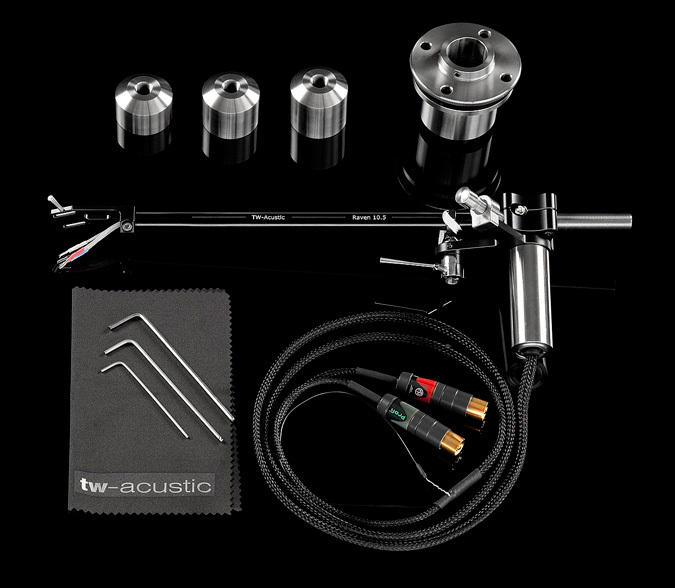 Aside from the wires and terminations, the ball bearings, and the arm lift (more on this later), all major parts are manufactured in TW-Acustic’s own machine shop in Herne, Germany, where all Raven ’tables and tonearms are made. This is perhaps unique: both design and manufacture are done under one roof and not jobbed out. 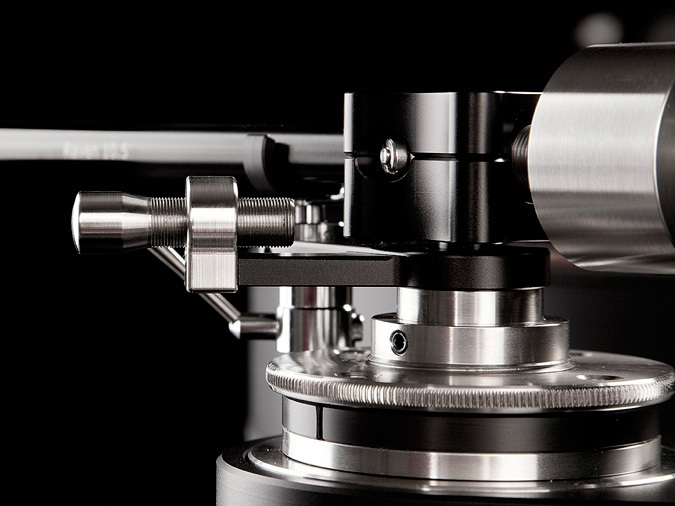 The result is an attractive tonearm that complements TW-A’s Raven turntables in look and feel. Its effective length of 267mm is slightly longer than most contemporary arms, and is the same 10.5" length as the famous Breuer. And the Raven’s effective mass of 14gm makes it compatible with a wide variety of contemporary MC cartridges, as Woschnik intended. The Raven 10.5 was delivered in a cardboard carton shipped directly from TW-Acustic in Germany. Inside was a handsome, briefcase-size case of medium-gauge black plastic. I popped its latches to see that all the Raven’s various parts were nestled in cutouts of charcoal-colored ester foam, under a flat, protective layer of the same. Aside from the major parts (which included three different counterweights), there was also a stainless-steel mounting disc for my Raven Two armboard, an illustrated user guide, a tonearm alignment tool, a mounting template, a VTA setup gauge, three Allen keys of different sizes, and a cleaning cloth. The guide is fairly thorough, explaining each step of the assembly process and its pitfalls. Warnings of Do Not Loosen The Screws! accompany the mention of the VTA and bearing assemblies. So Don’t. Installation itself was very straightforward: proceeding slowly, with breaks for review and comprehension, I accomplished it in just a little over 45 minutes the first time through. The arm-lift assembly seems out of keeping with TW-Acustic’s usual level of quality: Its tiny screws kept working loose from my finger-tight settings. Later, Woschnik told me that the mechanism was made by Jelco in Japan, and that made sense. Though I finally got the arm lift to work well enough, it lacked the feel of fineness and solidity of the rest of the Raven 10.5’s parts, all machined in Woschnik’s own shop. Mounting my Zyx Airy 3 cartridge on the Raven was easy; the TW-A’s headshell feels delicate but not flimsy. Caution: to protect the headshell’s black anodizing, you must use the provided plastic washers and shim. TW-A’s alignment tool had grids for three major alignment methods: Baerwald, Löfgren, and Stevenson. I used Baerwald. The choice of counterweight depends on the cartridge used. My Zyx Airy 3 with Silver Base weighs 8gm, so either the small (for 4-10gm carts) or the medium (8-14gm) counterweight would serve. The large counterweight works with cartridges weighing from 12 to 20gm, so there’s a good range of flexibility here. The steel counterweights feel like lab instruments, smooth in the hand and threading easily; it was a pleasure to handle them. At first, I used the medium weight. The arm balanced, I set the VTF to about 1.8gm and was nearly ready to go. Setting VTA is aided by TW-A’s alignment tool, which provides a calibrated guide up to 20mm above the record. Turning the VTA wheel lifts and lowers the arm through a range of about 10mm. Using the tool, I set the horizontal line of the arm to about 12mm above the platter, knowing I could adjust VTA by ear once I’d put an LP on the platter. The feel of the machining is very fine and deluxe -- no nicks or stickiness interfered with the operation of the adjustment wheel. Adjusting the antiskate is entirely intuitive. Depending on the movement of the tonearm in the runout groove, you screw the magnetized bolt in or out of its holding strut. As with the arm’s other machined parts, the bolt’s movement was supple and fine. Overall, the Raven 10.5 is an extremely tight piece of kit. Though the Raven 10.5 provides for the adjustment of a cartridge’s azimuth via an Allen screw that clamps the headshell to the armtube, I left this entirely alone, as I encountered no telltale problems with female voices or violins wandering in the soundstage. The TW-A arm operated without a hitch throughout the long review period. I played mainly stereo LPs with the Zyx Airy 3 -- a cartridge of moderate compliance that tracked perfectly. Following the initial setup I made only one adjustment: swapping out the medium for the small counterweight, as I felt the latter made the already impressive Raven 10.5 quicker and more lithe in response with no loss of extension. The music seemed to breathe more easily. From the start, the Raven 10.5 performed beyond my expectations. With virtually no break-in, notes from midrange instruments seemed deeper and hung around longer, with more of an organic sense of timing within the notes. There was more finesse, more inner detail within each note than I’d heard before from the same recordings, and more natural flow from note to note. And more bass . . .
Beethoven’s Piano Concerto No.5, for example, as performed by Claudio Arrau with the Concertgebouw Orchestra conducted by Bernard Haitink (LP, Philips Festivo 6570 086), sounded as if there were more bottom, more pitch definition to that bottom, and thus a fuller orchestral sound. The orchestral thrum seemed deeper, stronger than I’d noticed before. The violins were warm, not shrill, and the violas, cellos, and double basses together made an orchestral swell that created a great fundament for the entire piece. And when Arrau played his piano’s lower keys, the bass was richer and more pliant, while his chords chimed and trills rang more sweetly, seemingly with an extra sheen of harmonics. In the introduction for unaccompanied piano of the Allegro's first movement, Arrau’s arpeggio across the keyboard put out an extremely pleasing bass grumble, and the upper bass had a natural depth I’d not heard before. Arrau is known for touch rather than attack, but the Raven’s speed and agility let me hear nuances of phrasing new to me; the system’s responsiveness to tinier and subtler aspects of piano performance had taken a nice leap forward. Even as the Raven 10.5 impressed me with its clarity, sparkle, and organic flow with Arrau’s Beethoven, it demonstrated equally extraordinary agility with the swing-style dawg music of Emmylou Harris’s cover of "How High the Moon," from her Evangeline (LP, Warner Bros. BSK 3508). Tony Rice’s solo on acoustic six-string guitar was alternately feathery and emphatic, accompanied by the soft chiming of Albert Lee’s electric rhythm guitar. Then Ricky Skaggs’s mandolin solo came in, slappy, syncopated, and plucky. After another of Harris’s almost demurely sung choruses, Lee’s solo on hollow-bodied electric guitar had a welcome, snarky bite and sparkle. Jerry Douglas’s homey acoustic Dobro slide finished off the round with its own steely funk. Cheryl Warren and Sharon White, singing backup in close harmony, sounded sweet and campy -- like studio strings. The succession of starkly differing timbral signatures was like a multi-course meal of small, savory dishes constantly refreshing the palate. But of all the music familiar to me that I played, what whipped my head around was a recording of Brahms’ String Sextets by the Cleveland Quartet, with Pinchas Zukerman and Bernard Greenhouse (LP, RCA ARL2-4054). The first movement of Sextet No.1 in B-flat Major, Op.18, Allegro ma non troppo, just had more drama and sensuous presence than I’d heard before. The violins’ top notes were gorgeous and just slightly piquant, while the cello and viola swelled like softly pitching seas. Cello and viola pizzicati were beautifully mellow. There was tremendous depth to the soundstage, stunning spatial cues, and a great timbral and imagistic separation of the instruments. The sinuousness of the music reminded me that Brahms took some of his inspiration from Hungarian dances. The rich harmonics thrown off by the instruments, all of a fabric, never occluded the notes themselves. What I heard was a tremendously direct sound -- fast transient response, big and continuous bass, fantastic flow and pacing, and pleasing solidity with no loss of finesse. Coherence, speed, and clarity were the words in my notes as I began to wonder what in the Raven’s design and construction produced these qualities. 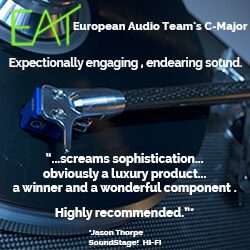 I guessed that the sheer loveliness I was hearing was a result of the arm’s simple, direct design, the steadiness of its bearing, the relatively low parts count, and fine machining of everything. The Raven 10.5 was steadier, handled resonant vibrations better -- or kept them to a minimum. 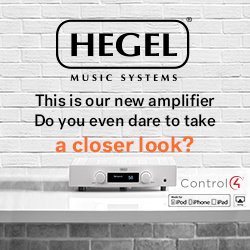 The results were a quicker, smoother response, more solid notes, less raggedness, and a bigger, more articulate bass. Great with delicacy, slam, macro- and microdetail -- the Raven just seemed to dig more music out of the grooves. It was the same with jazz recordings. Many nights in succession, I played LPs of Art Pepper playing alto sax with a big ensemble, the Duke Ellington Orchestra from the 1960s, the hard bop of Charles Mingus and Art Blakey’s Jazz Messengers, and the bossa nova of Stan Getz and João Gilberto. The Raven was great with all of it, reproducing the intricate and subtle timing of this music with more precision, and letting the spontaneity of the playing come through. The TW-A tonearm presented the rich tonalities of these LPs with even more solidity, but with a new delicacy and moments of sensitive detail. For instance, Sarah Vaughan’s voice in "You’re Blasé," from her How Long Has This Been Going On? (LP, Pablo 2310-821), was like a gondola on Venice’s Grand Canal on a summer night. Her singing here had a kind of waterborne saunter, using a sinuous melodic line as a surface she could skate and glide on. Oscar Peterson’s piano, crystalline and eloquent in his solo, and Louie Bellson’s subtle brushwork on the snare and floor tom complemented the tune’s languorous quality. About halfway in, Joe Pass contributed beautiful, running fills on electric guitar. But when Vaughan sang the song’s title line, she used her voice like a boat with a tenor sax at the oar, sliding through notes and breathing hard into the fundamental with a shimmering vibrato. The effect through the Raven 10.5 was the closest to attending a live club date that I’ve yet heard. 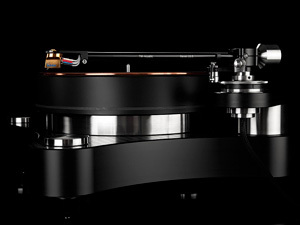 My reference tonearm for over two years now has been the Tri-Planar Mk.VII Ultimate II ($4950). A gimbaled arm known for a big, somewhat bloomy sound that’s more on the sensuous than the cool and analytic side, it has a reputation for being one of the finest "precision" arms in analog, boasting a calibrated VTA tower and vernier wheel that together permit fine, repeatable adjustments. Its bearings are polished needle cones, and its vertical bearing, unlike the Raven’s, is at record height rather than being parallel with the headshell, the theory being this lessens the see-saw effect of the tonearm as the stylus tracks in the groove. Finally, the Tri-Planar’s 250mm effective length is 17mm shorter than the Raven’s, and its effective mass is 3gm lighter. 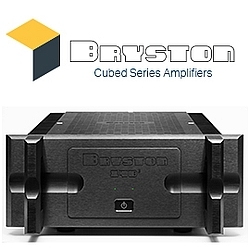 The Tri-Planar Mk.VII UII’s closest competitor till now has been the Graham Engineering Phantom II Supreme ($5550). Both arms are made in the US and are comparable in price to the Raven 10.5 ($5500). After a couple of months with the Raven 10.5 on my Raven Two ’table, I swapped it out to hear the difference with the Tri-Planar arm installed, listening to all of the same LPs I took notes on with the Raven. There wasn’t much question about which I preferred. Granted, the Raven 10.5 has been voiced using a Raven ’table much like mine. But the differences in resolution, speed, clarity, snap, and sparkle between the two arms, as mounted on my own Raven ’table, were fairly wide. The Tri-Planar had the edge in soundstaging depth and breadth, and its calibrated tower and vernier dial make VTA adjustments much more easily repeatable. But imaging belonged to the Raven, along with terrific transient agility, snap, and precision. The TW-Acustic arm -- on the TW-Acustic ’table -- made the music sparkle more. I felt much more the dynamics of each musician’s performance -- the shifts of emotional intent as a player changed how he played: guitar strings touched nearer the bridge or the sound hole, chords slowly feathered or strummed with force, etc. The timing of musical acts was so much more discernible, the pauses between notes so much more of a piece with the flow. And via the Raven 10.5, transient dynamics were superb. Most telling was that the Raven 10.5 let me more easily hear differences between recordings. Via the TW-Acustic arm, I could immediately hear that the Philips recordings of Alfred Brendel playing Mozart piano concertos were warmish and "polite" in terms of orchestral sound, and the overall dynamics somewhat damped in comparison with Robert Casadesus’s Columbia Masterworks recording of piano concertos 26 and 27 with George Szell and the Cleveland Orchestra -- which, though detailed, can sound brightish and dry. I heard such differences with the Tri-Planar, though not so dramatically or with the same degree of certitude as with the Raven. I conjecture that the Tri-Planar might work well with a wider variety of turntables -- but in combination with my TW-A Raven Two ’table, the Raven 10.5 arm brought me much closer to the character of the recording itself. The Raven 10.5 consistently captured more sonic events, and captured them more continuously, than the same LPs played with the Tri-Planar Mk.VII Ultimate II. 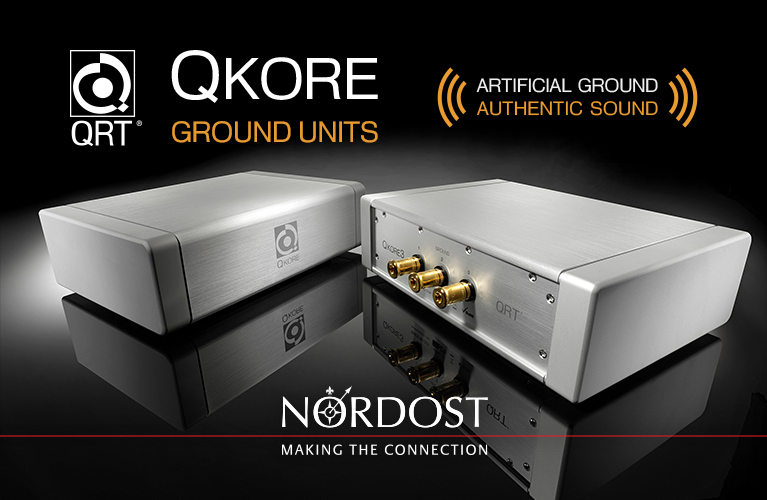 Other reviewers, writing on different equipment, have described this effect as sounding like a gain of 2-3dB just from swapping arms, and that a given piece sounded bigger and bolder than another. That was not untrue, but to me it was as if the Raven arm’s simpler design made possible a more direct mechanical connection in the analog chain, resulting in a purer signal being transmitted by the cartridge, through the arm, to the electronics. The effect was thrilling, substantial, and immediate. To use an old audio analogy, it was as if I’d moved from mid-hall to Row 6 -- much less was lost to ambient noise, to transients disappearing for all the distance involved, and there was a big step forward: I felt the sound as much through my body as through my ears. 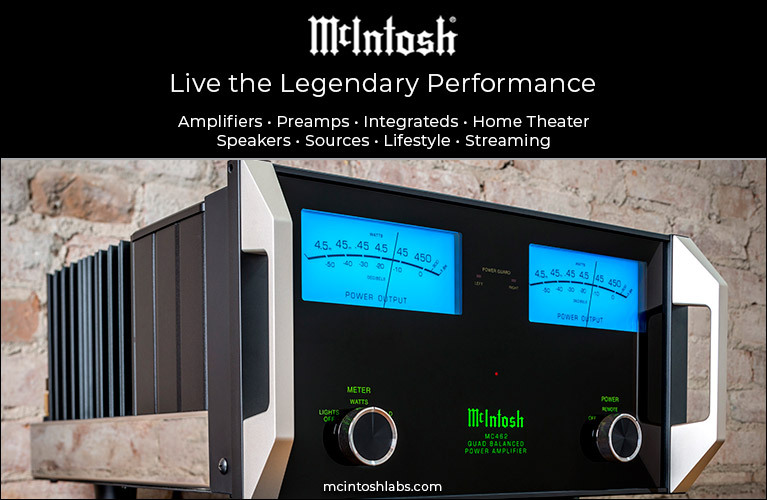 Though always an auditory phenomenon, music became a much more visceral experience through the Raven 10.5. Stravinsky’s Le Sacre du Printemps, performed by Colin Davis and the Concertgebouw Orchestra (LP, Philips 9500 323), is a record I’d long relegated to a back shelf. It’s not a bad recording or a poor performance -- far from it. Many prefer Davis’s conducting of this piece as more even-handed, less thrill-seeking, and more sensitive than others. But this LP always sounded to me a bit flat in comparison to, say, the London recordings of Zubin Mehta and the Los Angeles Philharmonic or Georg Solti with the Chicago Symphony. But playing this Philips LP with the TW-Acustic Raven 10.5 brought out an entirely different order of sound than I’d heard before. All the sweetness and harmonic richness were there in the woodwinds and strings, but now, much more than before, the bass drum and timpani emerged from the deep background to take more robust roles as musical and rhythmic characters in the piece. The bass drum, particularly in the final movement, seemed the main character, pushing the music forward propulsively, dramatically, authoritatively. The sound wasn’t deafening -- just forceful, insistent, dramatic, and completely thrilling. The Raven arm had so much extension, pitch definition, and responsiveness that it could render very deep, complex bass with ease and superb musicality. It was more, umm, lifelike. And ain’t that the point? So I bought it. The Raven 10.5 tonearm is mine. If you have a turntable comparable to my Raven Two, I strongly suggest you consider making a Raven 10.5 yours as well.